Bhopal: Madhya Pradesh chief minister Shivraj Singh Chouhan received Rs 10 crore bribe from Sahara India Group just ahead of the 2013 assembly elections, Income Tax (IT) department documents suggest. This has been alleged in an application moved by prominent lawyer and activist Prashant Bhushan in Supreme Court seeking investigation into the matter. 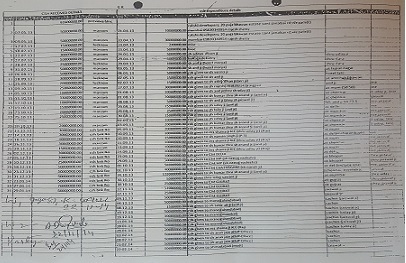 The documents, part of IT appraisal report related to raid on Sahara India group premises in November 2014 (copies with NewsBits.in), have entries showing two cash payments of Rs 5 crore each to ‘CM MP’ through Neeraj Vashisth(a) – deputy secretary with MP CM House. Page 89 of the IT appraisal report shows that the cash payments were made on September 29 and October 1, 2013, in Bhopal just ahead of the assembly polls held in November 2013. The payments from the Sahara side, was through one ‘Jaiswal ji’. The same documents, now being termed as ‘Sahara diaries’, allegedly show that Prime Minister Narendra Modi received Rs 40.1 crore as bribe from Sahara India between October 2013 and February 2014, when he was the Gujarat chief minister and already a prime ministerial candidate of BJP. Swaraj Abhiyan chief and renowned Supreme Court lawyer, Prashant Bhushan has alleged a cover up in the matter and he has petitioned the Supreme Court apart from other investigative agencies. “I have approached Supreme Court in the matter seeking in-depth investigation. The hearing is likely soon,” Bhushan told NewsBits.in over telephone. It was on the basis of similar documents related to IT raids on Aditya Birla Group that Delhi CM Arvind Kejriwal had alleged that PM Modi took Rs 25 crore bribe from Aditya Birla group. Bhushan also made complaint to Chief Vigilance Commission (CVC) and the two retired judges heading the Special Investigating Team on black money in this matter on October 25. 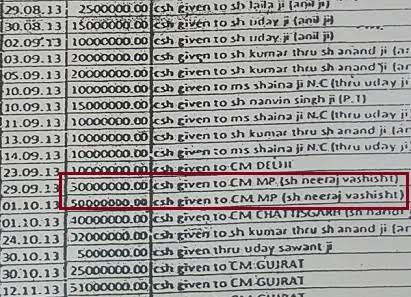 The same page of IT report shows huge cash payments to ‘CM Chhattisgarh’ (Rs 4 crore) and ‘CM Delhi’ (Rs 1 crore) apart from some other BJP leaders including a prominent lady leader. Meanwhile, Sahara India has approached the Income Tax Settlement Commission in the matter, sources said. The head of the IT probe team in matter, KB Chowdary was mid-way appointed as the Central Vigilance Commissioner by central government. Prashant Bhushan has challenged the appointment, sources added. The emergence of the documents in public domain has heated up the political atmosphere in Madhya Pradesh with Congress and Aam Aadmi Party baying for the blood of CM. MP Congress chief spokesman KK Mishra said that the allegations appearing through documents were very serious and CM Shivraj Singh Chouhan and Neeraj Vashishtha should immediately issue clarifications. “Also as the central government is of same party, it should be asked to investigate as to how and why the documents got into public domain. Also the involvement of other IAS officers close to CM Chouhan should be investigated in the matter,” Mishra said. AAP MP convener, Alok Agarwal said the issue is very serious and AAP, MP unit was writing to the CVC seeking thorough investigation into the allegations. “The chief minister (Chouhan) should clarify in public interest as to what happened to the huge funds as he showed cash of only Rs 70 lakh in his assembly election affidavit of 2013,” he said. NewsBits.in tried to seek response on the matter from MP CM’s secretariat by sending text to principal secretaries Ashok Barnwal and SK Mishra. There was no response till filing of this report.